I received 2 sets of Jamberry nail wraps in order to facilitate an honest review. All opinions are my own. 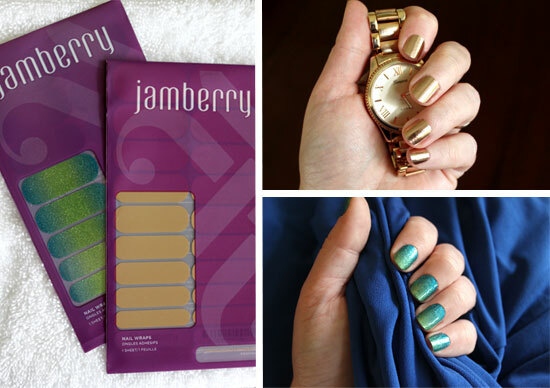 I love, love, love having pretty nails, and usually I paint them, but recently I was given the chance to test-drive some Jamberry nail wraps through the lovely Jamberry Independant Consultant Alicia Sherman. I've tried the nail wraps you buy in the drugstore and I wasn't that impressed. I've heard great things about Jamberry, so I was curious as to how different they were. I applied them, I tested the wear-length, and I removed them, and here's what I found. I picked out two gorgeous sets of wraps: The metallic Rose Gold and the glittery ombre Atlantis. I have to tell you how hard it was to narrow it down to two. They have so many amazing prints, colors, and finishes that it took me at least an hour. Seriously, I wanted about 20 different sets. I chose the in-vogue Rose Gold because I just can't resist a metallic finish. The best part about these wraps is that it is a true metallic finish. I remember the closest I ever got is with a chrome polish back when I was a teen, but even that was a bit sloppy compared to this. You really can't tell in the photos of the sheet, but they have a beautiful reflective quality. I can't resist blues and greens and these two together are just perfect. It has a very smooth glitter finish; If this were a glitter polish, I don't think I could get it this smooth without a bazillion topcoats. I love the ombre effect, but I can rarely achieve it with polish so perfectly, so I couldn't wait to try them out. I first applied the Rose Gold and put it to the test. The color is gorgeous and as a bonus, it perfectly matched my rose gold watch! You have no idea how happy it made me to look down and see that. It's the little things, y'all. 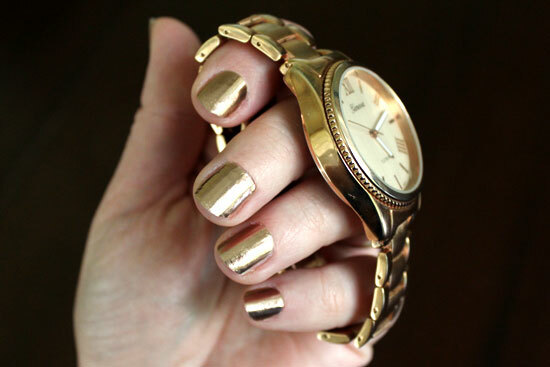 I wore the Rose Gold for about two-and-a-half weeks before I had to change them out. That's a long time for polish, and even for wraps. The drugstore brand wraps I had tried in the past didn't last that long. Now it was time to remove. I had trouble with one particular drugstore brand of wraps, in that when I removed them, I also removed most of the tops of my nails. It took forever to grow that out! 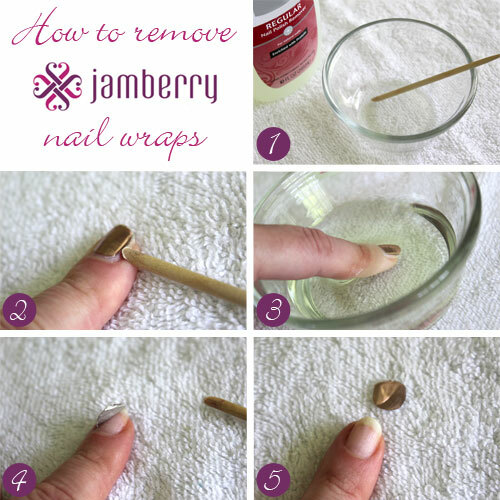 Jamberry lists a "quick" method of removal (unsealing and pulling off) and a "gentle" method (unsealing and soaking.) 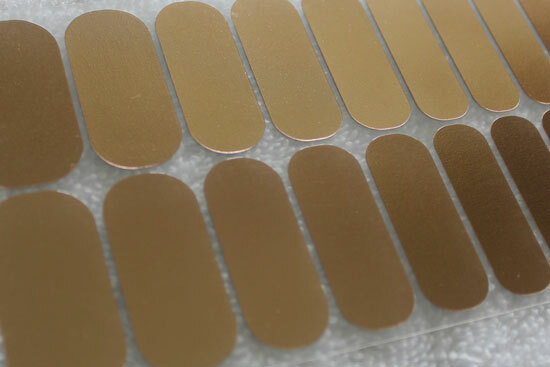 The longer you've been wearing your wraps, the more gentle you should be with removal. Since I had trouble in the past, I opted for the "gentle" method right off. You'll need nail polish remover, a small bowl, and an orange stick. Using the orange stick, gently break the seal along the edges of your nails. Submerge your finger in a small bowl filled with nail polish remover for 30 seconds to help dissolve the adhesive. Use the orange stick to gently loosen the wrap. If you run into and firm areas, soak again. Fully remove your wrap. It sounds like a process, but it was pretty quick, and you can soak a full hand at a time. 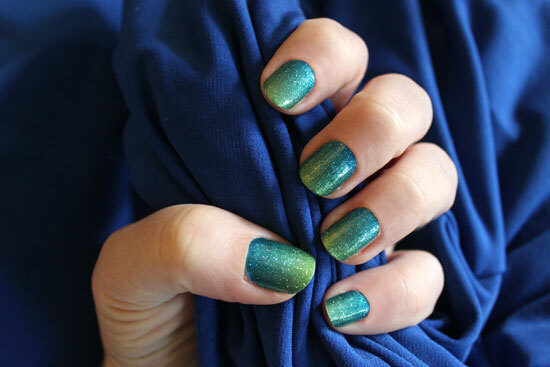 Next, it was time to try the amazingly beautiful Atlantis wraps, and I did another tutorial for you. Clean your mails of any oils with rubbing alcohol on a cotton ball and allow to dry. Match up your nail to the correct-sized wrap. Pop the edge of the wrap off of the sheet. Use your orange stick to hold the edge up. Use your fingers as little as possible when handling the wraps. Snip the wrap in half. You'll use the other half on your other hand. Warm the wrap with a blow dryer, heater, or other heat source for 3-5 seconds. It will curl up, and you'll know it's ready. Position the wrap on your nail. It can be repositioned if it's off-center. Smooth the wrap down on your nail and use the wedge tip of your orange stick to make sure it's well-sealed around the edges. At this point, I heated the wrap again since it took me a few tries to get it on straight. The directions give a re-heat at the end, but I found it worked better for me to do it at this point. After the re-heat, make sure it's sealed to the nail well with your fingers or orange stick. Using your nail scissors (or a pair of nail clippers), trim the edge of the wrap as close to your nail tip as possible. Using your emery board or nail file in a downward motion, file the edges of the wrap until they're flush and smooth. Enjoy your long-lasting, super-funky manicure! The leftovers were perfect for giving my daughter a matching manicure! She couldn't have been more thrilled with the glittery results. 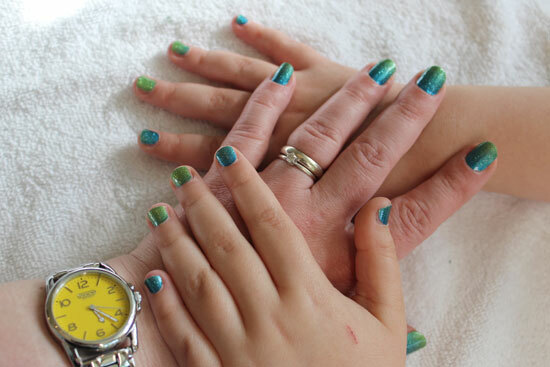 We have had so many compliments on our nails! 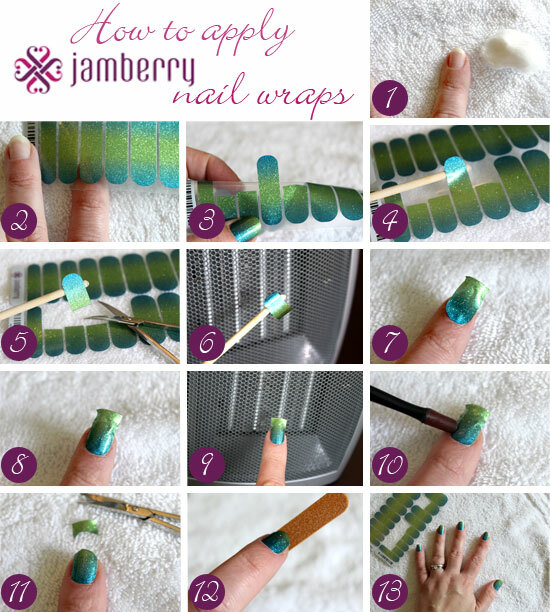 One sheet of Jamberry nail wraps will do 2 manicures and 2 pedicures and there will still be a couple of wraps leftover for accent nails! The 4 biggest wraps can do 2 pedicures: You cut one big one in half to do your two big toes and cut another one up into 8 pieces to do your little toes. At $15 a sheet with at least 2 manicures and 2 pedicures per sheet, that's $7.50 for a gorgeous mani/pedi that lasts for weeks! Worth it. They also have a nail art studio in which you can design your own nails with your own pictures. Very cool! If you'd like to check out Jamberry's nail wraps for yourself, you can find hundreds of designs on Alicia's Jamberry site. 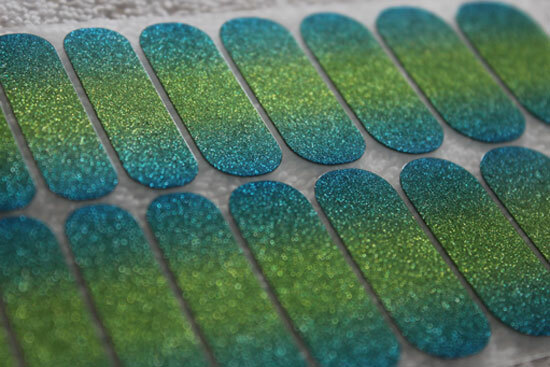 Have you ever tried nail wraps? What's your favorite Jamberry wrap design? Tell me in the comments!